I am guessing the logic goes something like this: there has been an unofficial Congressional White Caucus for 200 years (which is unjust), so in retaliation we now have a black caucus so we can do to them what they did to us. I understand this position, it is simply the desire for revenge, you hit me I want to hit you back. I am guessing, however, that a more productive and mature approach would be: we want to help people who are disadvantaged and in need, and we will accept help towards this goal from anyone who wants to give it. Rep. Clay is the worst form of hypocrite, they want to decry the injustices perpetrated by another group (in this case white congress) and at the very same time publicly stating that they want to do the exact same thing! Obviously it is a problem that more black leaders have not been elected (Barack Obama is currently the only Black senator) but the solution is not to form a black caucus and exclude the whites, especially considering that any white congressmen who want to join the CBC would presumably be their closest allies. I just knew I could pull it off one more time. One final hurrah before I leave the city, yes my car was broken into for the fifth time. I hadn’t even managed to get all the damage fixed from the last time. Surprisingly I don’t really care that much. Yes, it is money wasted and ya it is a pain but I guess I just expect it now. It is like paying taxes, not a favorite activity but you know there is no way to escape it. I guess I should be happy they haven’t tried to steal the car or steal parts of the car. The latest craze in Detroit is stealing catalytic converters. Amazingly they do this in the middle of the day on fairly busy streets. This has lead to a number of pairs being arrested but there are always more waiting to take their place. In case there are any enterprising criminals out there this is how it is done. One person walks the street looking for cars with a mirror on the end of golf club, if he spots a catalytic converter they can steal a van pulls up and double parks, someone hops out with an electric saw and cuts off the converter. In the neighborhood where I work two of my co-workers had their converters stolen in the middle of the day, and one of those they tried to steal it, failed, then came back two weeks later and stole it. Also about two blocks away I know two more people whose converters were stolen. Apparently they are being sold for scrap metal, sky rocketing metal prices have made it very lucrative. Over all car crime has spiked around the university. Between January and April this year 101 cars have been stolen on or immediately around campus, this compares to only 17 over the same period last year. It isn’t a big mystery why all the businesses, upper, and middle classes have fled the city, if they want to turn Detroit around they need to do something about the crime. And the mayor. I just found out about a great program here in Detroit called green currents. Detroit Edison (DTE) has negotiated contracts with existing renewable energy producers, they buy green energy credits and then pass them on to customers who sign up for the program. The electricity provided to the customer is then effectively provided by the renewable power plant (wind, solar, hydro, biomass, geothermal). Better yet is that DTE has been able to sign contracts with new renewable projects enabling them to be built. This has allowed the construction of a large new wind farm in Michigan, a farm biomass digester, and a landfill generating station. The best part is this will only increase my power bill by about $2 a month, or roughly 10%. To my knowledge Michigan isn’t exactly a wellspring of renewable power, it doesn’t have tons of hydro or wind (yet), so if they can provide customers with renewable options for only 10% more what is the big hold up in other places. I don’t understand the reluctance to sign Kyoto or some similar agreement. A 10% price bump (and it would almost definitely be less) isn’t going to grind the economy to a halt, and the extra money that is spent will just be reinvested in the country (infrastructures, jobs, etc). It seems to me a better economic stimulus would be to take whatever amount of tax money they are giving back to people and invest it in research and/or building of either renewable power (wind, solar, etc) or renewable transportation. I think a few billion would go a long way in making some progress there. 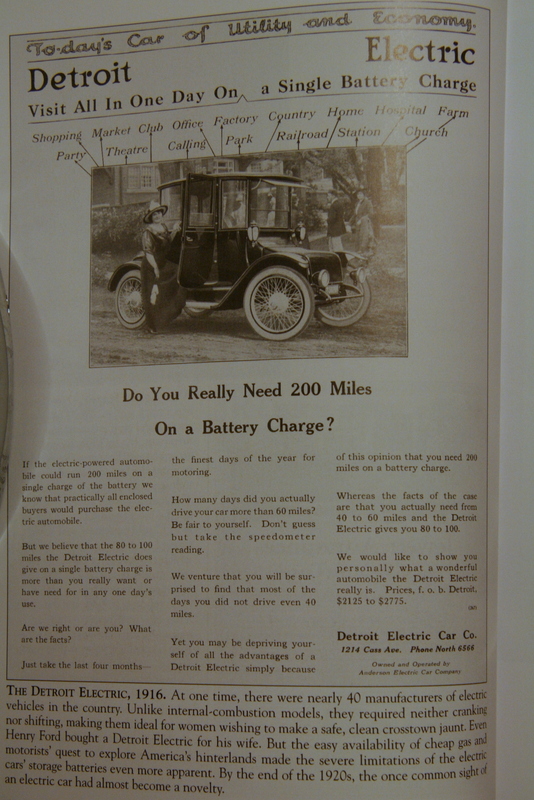 It is an advertisement for an electric car with a range of 80-100 miles, it is from 1916. It is nice to know that after 92 years, landing a man on the moon, inventing the computer, cellphones, and building super-sonic jets modern electric cars have a range of: 50-160 miles. You could replace the picture and price and run this exact same ad in a magazine today.